Welcome to Angel's Among Us in Pigeon Forge! 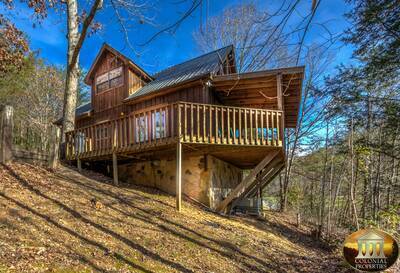 This single level 1 bedroom, 2 bath Smoky Mountain cabin rental is the perfect place to enjoy your vacation getaway. You'll love the quiet setting for the relaxation you deserve. The relaxing front covered porch features a porch swing and BBQ grill, a perfect spot to enjoy a quiet evening or a warm cup of coffee while vacationing here in the Smokies. Upon entering Angel's Among Us, you are immediately greeted by beautiful wood accents and comfortable, charming furnishings. The living area features a cozy stone accented fireplace and large flat screen HDTV and has an adjoining full bath for additional convenience. The country angel decor throughout this cabin add to the charm of this romantic mountain getaway. Angel's Among Us offers a fully equipped kitchen with everything you'll need to enjoy a delicious meal while staying at the cabin to prepare a picnic lunch, yummy dinner or mouth watering breakfast. The nearby dining table creates a quaint atmosphere to share a meal together. The wonderfully romantic master suite offers a 4 poster King size bed and a jetted tub nearby for romantic evenings with your sweetheart. There's also an in-suite full bath, flat screen TV and access to the screened in porch. Step out back onto the covered screened in porch for a truly peaceful experience. Here you will find a bubbling hot tub, rocking chairs, foosball table and best of all, the screened porch has a beautiful forest view. Soak in the hot tub, kick back with a mug of cocoa sitting in the rocking chairs or challenge each other to a fun game of foosball all while enjoying the peaceful sounds of the forest. Angel's Among Us offers easy access to downtown and all of the area's attractions and entertainment. This cabin is a great option for feeling like you're away from it all but still being a short drive back to the Pigeon Forge Parkway for shopping, dining, and the many attractions we have to offer. If you're seeking romance, rest and relaxation then plan your romantic, peaceful and serene Smoky Mountain cabin getaway today at Angel's Among Us! Angel’s Among Us provides you and your guests complimentary seasonal swimming pool access at Honeysuckle Meadows Pool and Deli! The pool is open from 10AM to 9PM EST daily, weather permitting. When you arrive at the pool, you will need to verify the cabin that you’re staying in. Additionally, there is a catch and release fishing pond located adjacent to the pool. Be sure to bring your fishing pole too! The address to the swimming pool is: 3151 Happy Hollow Road Sevierville, TN 37862 and they can be reached at 865-429-2350. A: It does not have an outdoor fire pit. A: Hi Tammy! This cabin is not pet friendly. We do have other options that are. “ Beautiful cabin, it provided the peace and atmosphere we were looking for.Very clean.Peaceful and relaxing.Great location also, only minutes away from everything we wanted to do. “ This Cabin was very beautiful, and very clean! A perfect place for a couple to get away. My husband and I came here for our honeymoon and it was wonderful. We would definitely stay here again and also recommend Angels Among Us to anyone! “ We enjoyed staying in Angels Among Us as it had a real cabin feel but was beautifully updated. The two bathrooms were convenient and very nice. We enjoyed sitting on the front porch swing and the rockers on the back porch. Several other cabins were within sight, but we heard no noise from them. The owners have done a good job of making this cabin attractive and comfortable. “ The cabin cute and quaint. 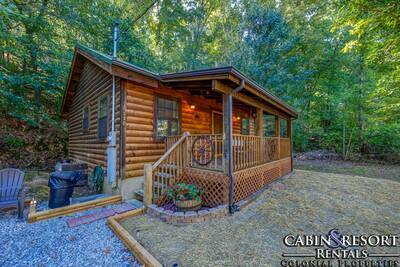 “ Great Cabin, very clean and well maintained. We celebrated our 18th Anniversary here. My wife and I love coming to Pigeon Forge, and this cabin is definitely top notch. Loved the place. Thank You!!! “ It was super clean and has everything you need! Will definitely use Colonial Properties again! “ The cabin was awesome and we enjoyed our stay very much it quite and peaceful clean closer to town than I thought it would. “ Cabin was very nice and secluded and very well maintained. The back deck area was very spacious and a great escape. The cabin location was far enough to be secluded, but yet close enough for easy commutes to attractions. I was very pleased with the check-in process. The whole process took less than five minutes. The staff was very professional.